Historic Venice Press is a publisher of regional interest books. 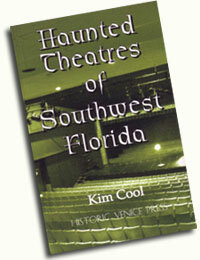 It all began because of a chance meeting at Walt Disney World on Dec. 5, 2001 and a discussion of ghost story books. The following April, Historic Venice Press had its name and Ghost Stories of Venice was coming together. Since that first tiny tome was published in 2002, the company has produced nine titles relating to the history and mystery of SW Florida and has begun a series of travel books that eventually will encompass the road trip possibilities of the entire state.